The heretofore unshakable belief among contemporary mainstream psychologists in statistical methods of inquiry defines what I christened several years ago ‘statisticism.’ After briefly reiterating the epistemic problem created by that –ism, i.e., the blindness it creates in its advocates to the logically unbridgeable gap between aggregate-level research findings and individual-level knowledge objectives, I note that because psychology is not only a basic science but also an applied discipline that underwrites interventions in the lives of individuals, there is a socio-ethical facet to the problem as well. This facet is then discussed within the context of two examples. One is drawn from the province of the evidence-based practice movement in psychology, and the other from the province of psychological testing in the service of preemployment screening. The latter portion of the chapter is focused on broader considerations of a socio-ethical nature. 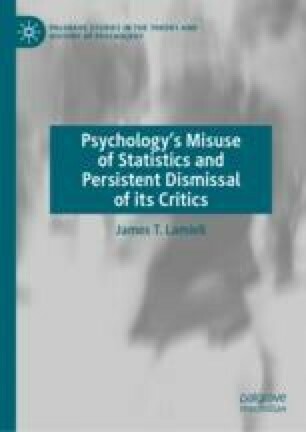 There, the discussion elaborates the way in which statisticism mandates a view of persons as things, and the potentially untoward consequences of this view for the individuals in whose lives statistically guided interventions are implemented. Stern, W. (1917/2010). Psychology and personalism (J. T. Lamiell, Trans.). New Ideas in Psychology, 28, 110–134. https://doi.org/10.1016/j.newideapsych.2009.02.005.